Last week, we looked at some ways to gain number sense about decimals. This post will address using decimals in the operations of addition and subtraction . . . and how to model concretely and pictorially. You can also download the color grid pages along with a free decimal math game in this post. Part 3 (future post) will address multiplication and division of decimals. If you missed last week’s post, please review it first before continuing with this one. Before performing various operations with decimals, students must have a basic understanding of how to represent them concretely, pictorially and numerically. Example: .8 = .80 can be proven with base ten blocks and with 100 grid drawings. This understanding should also be linked to fractions: 8/10 is equivalent to 80/100. 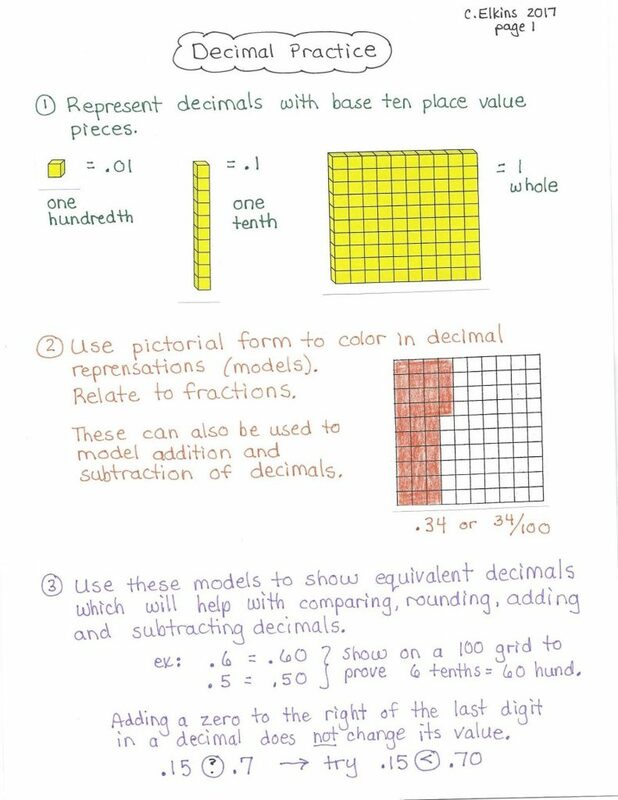 Click here for pdf of Representing Decimals page. 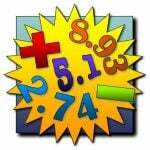 Number sense regarding decimals usually starts with fourth grade and continues with more complex operations involving decimals in fifth grade and beyond. It is this extension of the place value system and then relating them to fractions and percentages that often perplex our students (and the teachers, too)! Read ahead to get your freebies (Decimal practice notes, anchor charts, and Discovering Decimals Number of the Day / Game activity). Students must understand this base-ten value system extends in both directions — between any two values the 10-to-1 ratio remains the same. When using place value blocks in primary grades, students recognize the 100 square as 100, the tens strip as 10, and the units cube as 1. Then with decimals, we ask them to reverse their thinking as the 100 square represents 1 whole, the tens strip represents a tenth, and the unit cube represents a hundredth. This may take repeated practice to make the shift in thinking — but don’t leave it out. Remember the progression from concrete (hands-on) to pictorial to abstract is heavily grounded in research. Students will likely gain better understanding of decimals by beginning with concrete and pictorial representations. 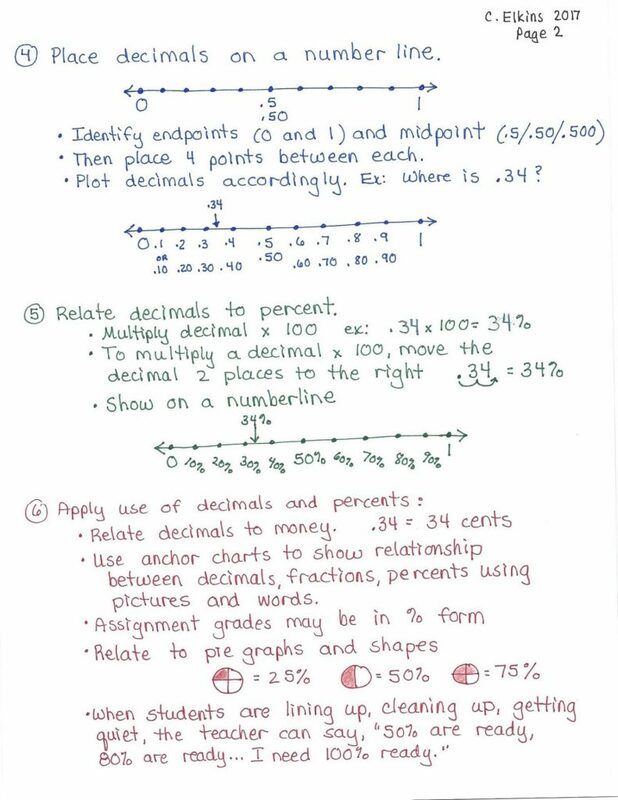 I am sharing my decimal practice notes, which highlight some of the basic concepts to consider when teaching. Pronouncing the names for the decimals is not in these notes, but be sure to emphasize correct pronunciation — .34 is not “point three four.” It is “thirty-four hundredths.” Use the word and for the decimal point when combining with a whole number. Example: 25.34 is pronounced “Twenty-five and thirty-four hundredths.” I know as adults we often use the term “point,” but we need to model correct academic language when teaching. You can get also the pdf version of these notes by clicking here: Decimal practice teaching notes. 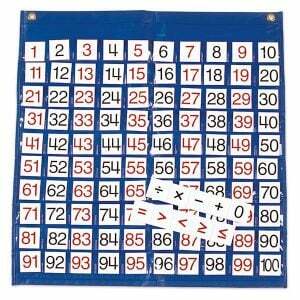 This post will focus on ways to use a 100 chart to teach or review several math standards in the number sense and number operations strands (all grade levels). Each of these strategies can be completed in just a few minutes, making them perfect for your daily math meeting. Choose from counting, number recognition, number order, less/greater than, odd/even, addition, subtraction, multiplication, number patterns, skip counting, mental math, 1 more/less, 10 more/less, etc. You can use a 1-100 chart poster on the smartboard, in poster form, or as a pocket chart. The pocket chart is the most versatile. See an example here: enasco.com pocket chart Here is also a link to little colored transparent pieces that can be placed in the pockets to highlight chosen numbers: enasco.com pocket chart transparent inserts I often show students that a 100 chart is actually just a giant number line all squished together instead of spread out across the room. To do this, I print off a chart, cut it into rows, tape the rows together, then highlight each multiple of 10. Second concept is that the lower numbers are at the top, and the higher numbers are at the bottom. Instead of starting with a full 100 chart, start with an empty chart. Add 1 number per day in order, building toward the 100th day of school. This would be suggested for KG level. Number locating: Just practice locating numbers quickly. If asked to find 62, does the student start at 1 and look and look until they find it? Or can they go right to the 60s row? 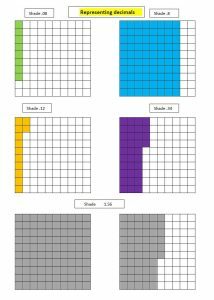 Place Value Pictures: You can’t do this on your hundred chart at meeting time, but there are dozens of picture-making worksheets available for free on TPT in which students follow coloring directions to reveal a hidden picture. Students get much better with locating numbers quickly with this type of practice. Guess My Number: This is great for reviewing various number concepts. Here are a variations of guessing games. You can use with 1-100 chart, or 100-200, etc. Teacher writes a number secretly on a piece of paper (ex: 84). The teacher gives a single clue about the number, such as: “My number is greater than 50.” Then let 2-3 students guess the number. Confirm that they at least guessed a number greater than 50. Redirect if not. If you have the little colored inserts, place one in each of the incorrect numbers so students will know what was already guessed. If you don’t have those, just write the guessed numbers somewhere where students can see. Give a new clue after every 2-3 guesses until someone guesses the number. After guessing correctly, I always show the students the number I had originally written down so they will know I was on-the-level. Here are some example clues for the secret number 84: My number is even. In my number, the one’s place is less than the ten’s place. My number is less than 90. My number is greater than 70. If you add the 2 digits together, you get 12. The one’s digit is half of the ten’s digit. Again, affirm good guesses because at first there may be several numbers that fit your clue.